Contrary to expectations, it is the large-scale, colour digital images that are most gripping in this vast and eclectic exhibition, rather than the historical and 20th century photographs. Perhaps it is to do with the way in which these contemporary subjects chime with our rapidly changing impression of India. Spanning 150 years, starting with the earliest high street studios established in the 19th century, the exhibition tells the story of photography’s development in the Indian subcontinent. The craft of hand-tinting black-and-white or sepia pictures emerges from this earliest period as a wonderful and touching popular art form all of its own. The show encompasses social realism and reportage of key political moments in the 1940s and 1950s, famous people, amateur snaps from the 1960s and street photography from the 1970s. However, a presentation or exploration of the theme promised by the show’s title – about the parallel or intersecting development of photography in India, Pakistan and Bangladesh – is absent. It would be impossible to say, for example, if there was a divergence in style or content in photography in the three countries after Independence, or not. Often it is hard to say what country you are in. The photographs are instead presented in five themed sections, and it must be said that there are more than enough great photographs here to justify the visit. The theme entitled The Performance contains a wonderful collection of film publicity shots and portraits of the stars, from the earliest days of Indian film to the present. The glamour and intensity which characterised Hollywood photography of the 1940s lives on today in Bollywood and Lollywood (the newly-coined title for the film industry in Lahore). The mental labour that goes into performance is explored in three adjacent portraits of an actor in the full blue and pink body make-up of a god. Nandini Valli Muthia captures both the inwardness of rehearsal and, in the final portrait entitled Disillusioned, the doubt and vulnerability that comes with the territory. 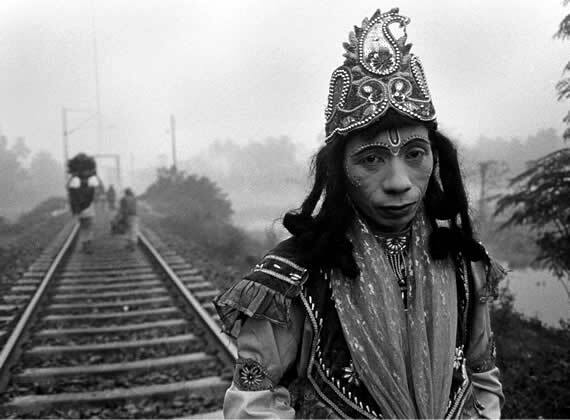 This section also includes a series of memorable photographs of circus performers, and what was for me the most striking and moving image in the show, of a Man Dressed as the Living God Krishna, photographed by Bijoy Chowdhury. A man looks seriously at us; he wears a headdress above his poor clothes and his face is painted in the style of the dark-skinned God beloved of the common people. He stands at the side of a railway line, which stretches away into the distance behind him. What is he waiting for? What is he doing? It is a mysterious image which suggest the integration of ritual into the everyday. The Portrait shows the changes in the presentation of individuals. In a montage entitled I....Mine, Shumon Ahmed shows his subject meditating like Buddha in the roots of a fig tree and then in a colourful supermarket aisle. A series of penetrating photographs of identical twins by Ketaki Sheth hang opposite Sonia Khurana’s black and white photomontage, where an exuberant plump woman dances, leaps and flits from one frame to the next in a celebration of movement for the joy of it. The Family captures significant changes in social life for the better off in India – from the early hand-tinted photographs of families posing stiffly in front of religious pictures, to Anay Mann’s warm portrait of a weekend family in bed, reading the papers, chatting, and day-dreaming. The Body Politic charts political moments, movements and campaigns. A haunting series of photographs of illegal migrant workers from Myanmar (by Ravi Agarwal) includes a memorable image of a lonely distant figure at the foot of a quarry, his hammer raised, surrounded by a whole world of unbroken stone which tells his future. Over 70 photographers are presented in the show, with works drawn from important collections of historic photography, including the Alkazi Collection, Delhi and the Drik Archive, Dhaka. They join many previously unseen images from private family archives, galleries, individuals and works by leading contemporary artists. Where Three Dreams Cross: 150 Years of Photography from India, Pakistan and Bangladesh curated by Sunil Gupta with Shahidul Alam, Drik Archive, Dhaka, Bangladesh; Hammad Nasar, Green Cardamom, London; Radhika Singh, Fotomedia, New Delhi; and Kirsty Ogg, Curator, Whitechapel Gallery, London, until 11th April 2010.